The words of John Lennon, and the story, as he told it, about how the song ‘Instant Karma’ was produced. It’s slightly inaccurate. It was written and recorded in a single day, Tuesday 27 January 1970, but not actually released until 13 days later however this detail is irrelevant. The point he was making was to stress the speed achieved within a working timeframe from concept to realisation. An improvised idea was developed and manipulated, then embellished into a finished item which retained the energy and spontaneity with which it was produced. He successfully captured a moment in time as compelling today as the day it was written. Although it is not always the case, sometimes the best results can be achieved when working with impulse and allowing serendipity to play its part. Once upon a time, in a world long ago, I worked in a design office. The name above the door, ‘Fast Art Fast Print’, reflected the nature of the activity inside the building. The nature of the job was to produce good quality design into print, and quickly. To steal a well known advertising slogan, it did exactly what it said on the tin. They were good days and the first time I’d worked in a graphic environment. The design process was alien to me, I was on a very steep learning curve but soon recognised the demands of the commercial world, and it has influenced my working method ever since. My aforementioned graphic background and the ever-present influence of Lennon, as well as my previous experience of such large scale painting, was worth its weight in gold with this ‘Bigger Picture’ project. I received a ‘late notice’ email to ask if I was available and if I would like to be involved. The next day a telephone conversation outlined details for the ‘Sharing Day’ project and the following day painting began. Not exactly ‘Designed at Breakfast, Painting by Lunch and Finished for Dinner’ – but it came pretty close. The mural was completed in two working days. Six different groups of children, arriving at 40 minute intervals, played their part on the first day; some worked with felt pens on paper with a view to creating a large graphic picture, others used stencils and painted directly onto the wall with their fingers. My role initially was as adviser and guide in order that the basic composition took shape, then as artist to complete the image, tidy and clarify previously painted marks as appropriate and to include some lettering. The finished painting is a success as a co-operative project and works as an illustration of a particularly special day on the school calendar. On Friday 18th October, Titchmarsh Primary and Warmington School joined together to engage in a ‘Sharing Day’ involving Painting, Poetry, Science, Music, Numeracy and Physical activities. The mural is certainly a reflection of the energy, enthusiasm, exuberance and effort of that fast paced day. A moment in time, captured in paint. Instant Karma? I’d say. A new year, another bigger picture project. 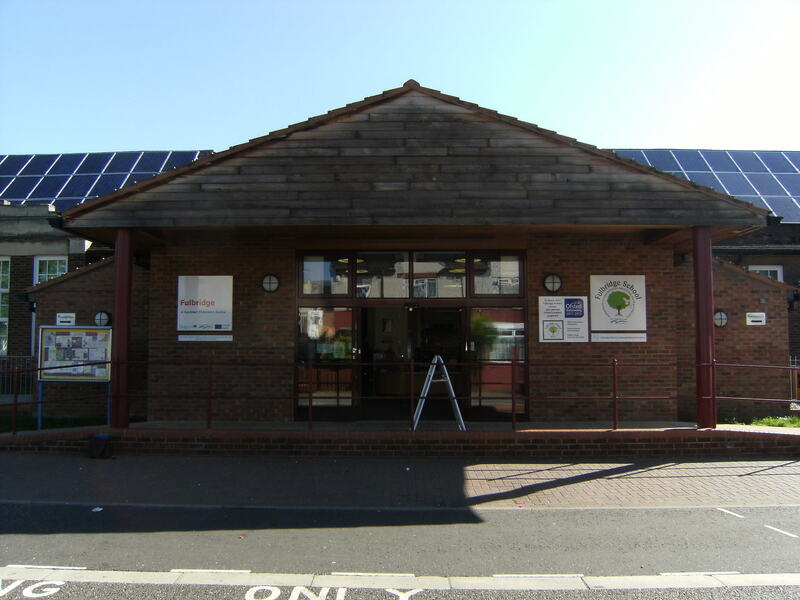 It was suggested toward the end of last year by Iain Erskine, Head of Fulbridge School, Peterborough. ‘I’ve a job I’d like you to think about,’ he said, ‘for the gable over the front entrance’. I’ve painted gable ends before but never within the confines of a triangle, so it was new territory. The subject of the painting was to celebrate the conversion from school to academy status, as well as an opportunity to upgrade and perform necessary maintenance to the front of the building. It would also highlight and promote its reputation as a school of creativity. The school’s mission is ‘Unlocking Potential: We believe that if we give children the roots, they will grow wings and fly’. Being an avid follower of Jethro Tull since the late sixties, this concept naturally caused their 1995 album ‘Roots to Branches’ to spring to mind and images began to fill my head. A composition I painted in 1981 also became an important source and influence too. After discussing ideas with Iain I began producing a variety of designs based primarily upon these two themes before presenting him with an initial scribble, which was then taken further as a coloured visual. The central motif is based upon the Fulbridge oak tree logo, with entwined roots spreading far and wide. White doves are scattered around the composition which increase in size as they take to the air. The school motto reflects and softens the angle of the gable and the new academy name takes pride of place. Two small child figures are located like bookends to each side, holding a paper chain of figures. 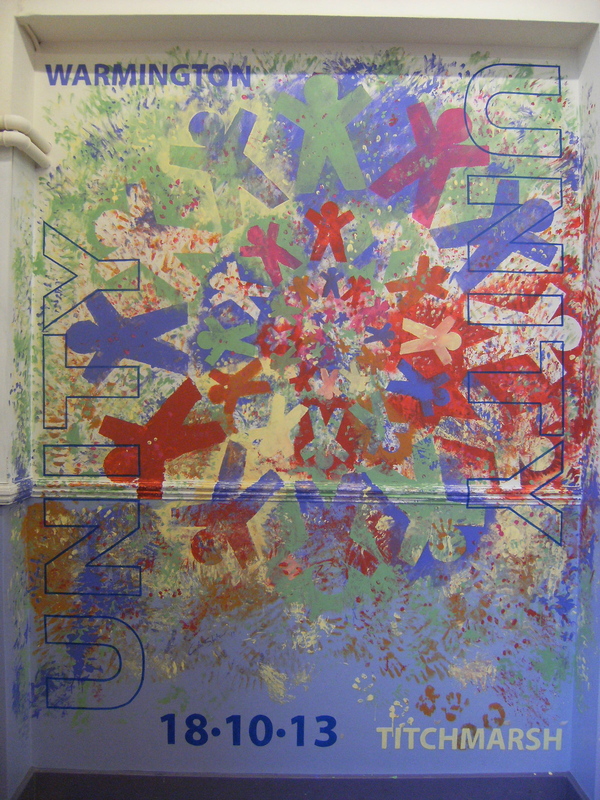 There are many cultures and languages spoken within the school, and this motif shows that all children entering the building are as one, with an equal opportunity to shape their own future. The painting from which these two figures were taken was painted in sepia tones, and I decided I would employ a similar palette for this project. The gable of wooden boards has been in place for several years, so I felt there shouldn’t be a dramatic and stark change. After all, the school is already ‘outstanding’ and its policy remains the same, there is no need to make it appear that it has become a different place. A sepia tone would not only look similar to the wooden boards but would also have a timeless quality, which was why my original composition was painted with such a palette. 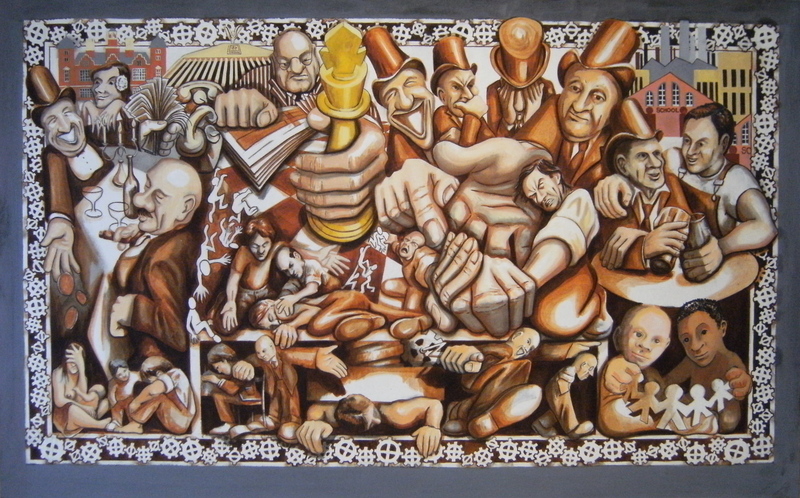 The image began life as a drawing commission from a chum to illustrate an apolitical ‘social ideal’. It is titled ‘Imagine’ and was my response to the assassination of John Lennon. It illustrates a simple but enduring message, one relevant to every generation if we are going to live together in harmony and with respect for each other. It was painted in oil on canvas and I wrote a poem to accompany it. It is a sentiment that is never out of date, and relocating the figures from this painting to the new composition was like passing the baton. It felt the right thing to do.